The 2016 NHL All-Star Game which is the 61st National Hockey League All-Star Game is scheduled to be held on January 31, 2016 in Nashville at Bridgestone Arena, home of the Nashville Predators. This will be Nashville’s first time hosting the NHL All-Star Game. This year’s NHL All-Star game will see significant changes to the All-Star Game format. Instead of one game pitted against conference team vs conference team, there will be three 20-minute games, with four All-Star teams based on the league’s four divisions. The Atlantic Division All-Stars will face the Metropolitan Division All-Stars, while the Central Division All-Stars will play against the Pacific Division All-Stars. The winners of these two games will then meet in the All-Star Game Final. The format for all three games will be 3-on-3. If a tie remains after 20 minutes, then it will go directly to a three-round shootout plus extra rounds as needed to determine the winner. There have been many formats to the NHL All-Star-Game which started in 1947 back when the Stanley Cup Champions would play a group of NHL All-Stars. 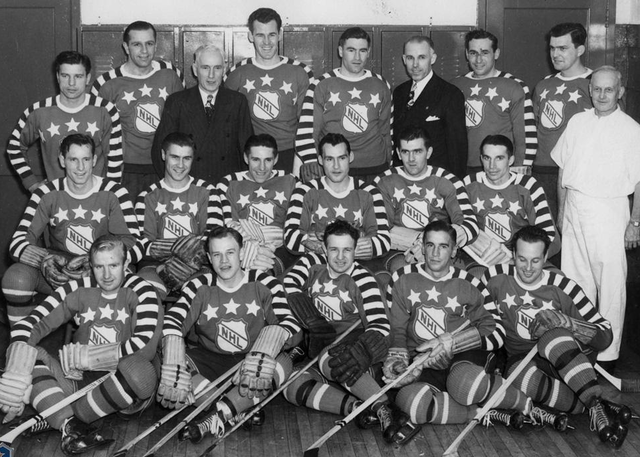 There were some “tribute” games that could have been dubbed all-star games prior to 1947, but officially the first NHL All-Star Game was held in October 1947. Here is a look at the all-time results from the previous 60 NHL All-Star Games. The first NHL All-Star team featured the likes of Maurice “The Rocket” Richard”, “Black Jack” Stewart, Bobby Bauer, Bill Mosienko and Woody Dumart to just name a few. The 1980 All-Star game feature a 50 year Gordie Howe competing in his 23rd All-Star game and a young 19 year old Wayne Gretzky competing in his very first NHL All-Start game. This was one of my all-time favorite NHL All-Star games. John Garrett goalie from the Vancouver Canucks was a late replace for Richard Brodeur. Garrett had a stellar performance in net and was probably on his way to winning MVP honors until Wayne Gretzky took over and scored four goals in the third period with Oilers teammate Mark Messier assisting on three of the four goals. You have to feel for Garrett as Wayne Gretzky would go on to stardom and collect a number of individual awards in the NHL. Ahh the only time that the city of Edmonton has hosted an NHL All-Star game. Wayne Gretzky, now a member on the Los Angeles Kings, would reunite with his old Oilers teammate and linemate Jari Kurri in a return to Edmonton. Campbell conference and Edmonton Oilers headcoach Glen Sather reserved Gretzky’s old stall in the Oilers’ dressing room, and he played on the line with then-current linemate Luc Robitaille and former linemate Jari Kurri. Gretzky was warmly welcomed in Edmonton, and for his part, scored a goal and two assists and was named the games MVP to which he earned the ceremonial car as the game’s MVP. As the story goes Gretzky then gave the car he won to friend, former teammate and Gretzky protector in Edmonton, Dave Semenko. A sold-out crowd of 17,503 in Edmonton welcomed the Great One back where he belonged. This game features my favorite NHL All-Star Game moment. Owen Nolan scored two great goals in the second period 8 seconds apart and then in the 1997 NHL All-Star Game, the San Jose crowd went nuts as their very own Sharks’ Owen Nolan completed a hat trick in style, by calling his shot on a third period breakaway. I still cannot believe he didn’t win MVP for the game (Mark Recchi took the honor) but Nolan’s hattrick goal was one of our favorites of all-time. This is so good we have two video clips to show. This goal was number one on our list of top 10 NHL All-Star Game moments.